New Boston Celtics guard Jason Terry was born in Seattle, a town that featured an NBA team throughout Terry's youth. In college, Terry played for the Arizona Wildcats, and he's enjoyed successful stints with the Atlanta Hawks and Dallas Mavericks since entering the NBA. 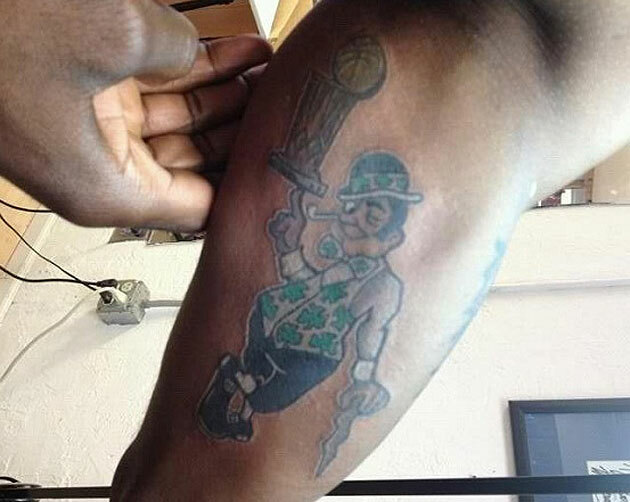 The man has plenty of logos to choose from were he to adorn his body with a tattoo of a particular basketball team's image, but in a wonderfully Terry-styled bit of whimsy, the player that is 2 1/2 months away from playing his first game with the Celtics has graced his left arm with a tat of the Celtics' famous leprechaun logo. Of course, this isn't the first time Terry has shown such preseason moxie. Out of seemingly nowhere — though the team in retrospect was very much a championship-worthy squad — the Dallas Mavericks took the 2011 title. Quite a few of us, citing matchups and depth in the Western Conference, had Dallas bowing out far before the NBA Finals; rarely giving championship consideration to a team that had failed in six previous attempts at winning a ring with Terry on board in Dallas. Deep into that playoff run, though, it was revealed that Terry had gotten a picture of the O'Brien trophy on his arm even before a regular season that most assumed would result in another ho-hum 50-plus win turn from Dallas and a second- or third-round ouster. Instead, the Mavs won it all. And Terry, ever full of engaging wit but not too much bravado (well, depending on your tastes, at least), looked a right genius for his move. This time around? Eh, Terry might have to revisit his mid-Finals approach from 2011 and have the thing removed should the Celtics fail to take in their second title in six years. Because though we respect the Celtics to no end, and think they did well to replace Ray Allen's minutes with that of a triptych featuring Terry, Courtney Lee and the recovering incumbent in Avery Bradley, a championship in Boston is even less of a sure thing in 2013 as it was for Dallas in 2011 — and Dallas' 2011 turn, though well executed and earned, was no sure thing. Kevin Garnett is a giant, and Paul Pierce is not to be dismissed, but neither is likely to match the sort of West-slaying and Miami Heat-embarrassing play that Dirk Nowitzki and Tyson Chandler came through with during the 2011 postseason. None of this matters, though. This is the sort of confidence that you want, from a guy that is being asked to improve a Celtics offense that ranked amongst the worst of all teams in 2011-12 and certainly amongst the worst of any championship contenders during last season's playoffs. This is what Terry brings — he doesn't think of the Celtics as the group that lost to a Miami Heat team that seemed to grow in stature five times over in the wake of winning the Eastern Conference finals last June. He thinks of the Celtics as a team that was one good half of basketball away from winning a chance at hitting the Finals for the third time in five seasons. And, it should be noted, it's a pretty fetching tattoo. Even if the self-loathing Mc in me doesn't exactly care for the leprechaun logo. With only three NBA teams to his credit since his ascension to the NBA in 1999, Terry can hardly be called a "journeyman"; but you rarely see such dedication from players of his ilk, working toward the later stages of a career, on a team that might be a few unfortunate injuries away from missing out on the second round of the playoffs. It's all very JET-like, and we'll always dig that.